Those checkers always look so neat but are a pain to apply or paint right? 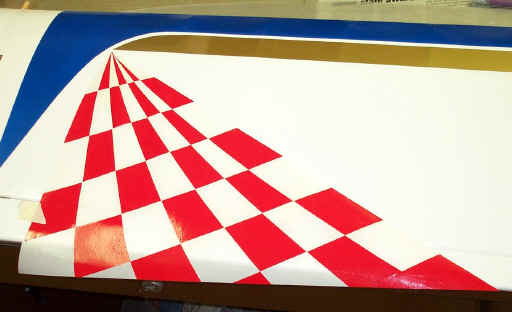 This page will cover how to apply checker board patterns to your airplane either with iron on covering or paint. Food For Thought It is always time well spent to design your paint scheme on paper before committing the plane to masking tape, paint or covering. Most people have a certain amount of time in their day to devote to day dreaming about different paint schemes (I do). Even if you aren't a graphic artist you should know what looks good to you and what doesn't. Borrow some paint jobs from other airplanes that you like and tweak it until you have something original. If possible draw a three view of the plane and color it with colored pencils to get a rough idea of how the scheme will look. There have been articles written on different patterns and colors on airplanes and how they appear in the air. A good compromise are large areas for visibility and small details that do not clutter the overall scheme that can be seen from the ground. Some paint jobs look like killers on the ground but when airborne they blend together like a big glob. White and yellow are the two most visible colors at a distance. Large areas of these colors help make the other trim colors stand out. 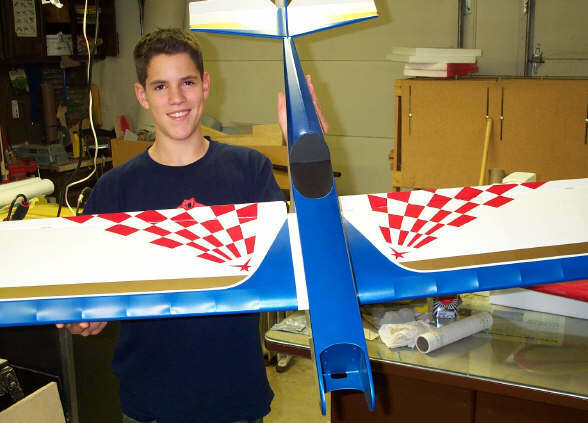 The R/C pattern people have utilized paint trim geometry and colors to offer a visible airborne plane. ARF planes have their place in the hobby but it will become pretty boring if all of the planes in the pits are covered with the same design. Control line aerobatics have a concourse award that is voted on by their fellow pilots and are appearance judged for points that are added to their flight score. This creates a field of better looking airplanes and originality. So jump in there and come out to the field with an original paint scheme or covering job. The painted checkerboard. Traditionally the painted checkerboard has been laid out one check at a time. With this method designing a pattern of checkers that were anything but square was too time consuming to pursue, at least for me. Even the square patterns were time consuming. The larger the pattern the easier it was to lay out but when you wanted small checkers that were bent or irregular it became almost impossible to get them to look right. Some of the techniques I will outline here in the paint section will be the same for the film covering section. For masking checkers I use a product called Friskit Film. This film is designed for masking and is semi transparent and is easily cut with a sharp X-Acto #11 blade. Friskit film can be cut on the model if the surface is solid (sheeted without open bays). The Chiros stunt plane I painted had the Friskit Film for the checkers cut on the airplane. The See Temp was used as a edge to guide the knife. This took a light touch on the trusty #11 blade but is easy once you get the hang of it. The Friskit really doesn't need to be cut to separate but just scored. I am not sure if there are vinyl cutters that will cut Friskit since I have never seen Friskit with the indexed holes on the edge for the cutters but it would be nice to have the computer controlled cutters do the job of cutting. Maybe taping the Friskit to the vinyl and running the vinyl through the cutter would work. If transferring the design from print then the Friskit material can be placed over the print and back lit. When doing the Citabria "N" numbers I used a glass toped end table with the lamp placed underneath for back lighting. A window on a sunny day would work just as well. 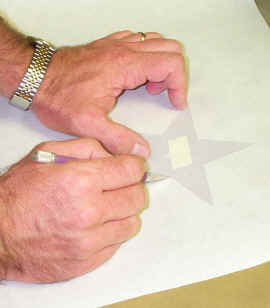 It also helps to use a transparent drafting triangle so you can see where the lines are when cutting the Friskit Film. If the Friskit is not cut on the airplane then bridges of masking tape will have to be applied to the Friskit stencil to hold it together while applying it to the model. When applying the Friskit to the model it is beneficial to peel the backing away from one corner of the stencil and adhere only that portion until you are satisfied with the alignment. If the alignment is correct then the backing can be slowly peeled away from the stencil. http://www.seetemp.com/ Click here to view the See Temp web Site. See Temp is used as a straight edge while cutting the Friskit stencil. See Temp material is used to make templates off of plans for formers, ribs, etc and works great for a templates to mask against or for cutting trim. This material is also transparent so that you can see the part you are duplicating. Picture shows See Temp on top of Edge 540 plans being scored to make rib templates. Although this picture has nothing to do with the Checkers I thought I would add it here to show other uses of See Temp. Masking against See Temp involves cutting the See Temp to the pattern desired and running the fine line tape up against it for a guide. If using film coverings you can use the See Temp for a template to cut the covering. Paint schemes with curved lines that need each pattern on opposing wings to be symmetrical will benefit from the See Temp template for masking. 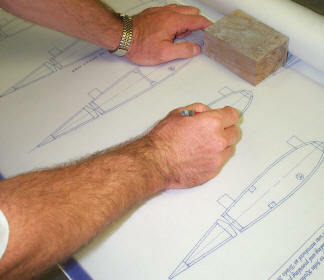 The See Temp material is also thick enough to act as a guide for the X-Acto #11 blade while scoring the Friskit Film. 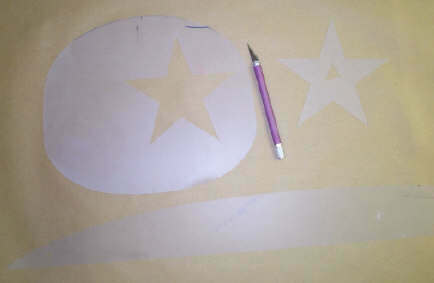 Although not a checker the star below is being cut on Friskit Film with the aid of a See Temp pattern. 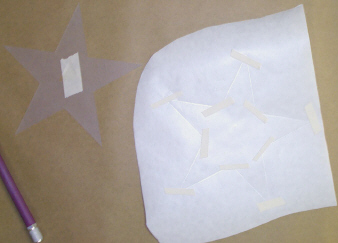 There is a cutout in the center of the star for masking tape to aid in holding the star in place while cutting the Friskit Film. For the fancier fonts it's beneficial to make a template out out of Friskit to guide the cut. With all of the different fonts and graphics available on computers the possibilities seem endless. Just print the font you want and lay the See Temp over the printed font and score. It is important to score the See temp with a brand new X-Acto #11 blade. Notice I said score. See Temp doesn't need to be cut it only needs to be scored. Once scored gently bend the See Temp at the score and it will separate. Once the pattern is free you can sand it if there are any rough edges or if in need of further shaping. Once the Friskit Film has been cut masking tape bridges are added to the cut template to hold it together while transferring to the plane. If doing a checker pattern you will need to place a thin strip of masking tape along all cut lines to hold all of the checkers in place. See Temp can be used as a template for making graphics from Ultracoat. Ultracoat adheres better to itself better than Monokote so it is a better choice for trim. The star template above was used on the Citabria Pro wing bottom. The inside cutout was discarded. The long curved template below was used as a guide to score the Friskit Film for the checkers on the Chiros below. The template was on a pivot at the tip of the wing and rotated downward to get the sweeping checker pattern. By scoring the Friskit film on the airplane it saves time since you don't have to make the masking tape bridges and transfer the Friskit Film to the airplane. For simpler designs you are better cutting the Friskit Film separate from the plane. The Chiros below was painted with automotive acrylic lacquer. What about Checkers of this design out of Ultracoat? (I prefer Ultracoat since it adheres to itself better than Monokote) I tried some checker test samples out of Ultracoat. I took the Ultracoat while still on its backing and cut the film down to but not through the backing paper. Once all of the checkers were cut I removed every other one to form the check pattern. Use a NEW #11 X-Acto blade here. Once the Ultracoat was cut in this manner I removed the backing from the Friskit Film and stuck it down over the checker pattern I just cut. The Friskit is used to hold the checkers in position while ironing. Once the Friskit is on top of the Ultracoat I peeled the backing off of the Ultracoat and placed the Ultracoat and Friskit Film onto the airplane. Once the checks were positioned I ironed through the Friskit Film with an Iron turned down to about half way to adhere the Ultracoat. The Friskit will soften a little but you will still be able to remove it after ironing. As with the painted checkers a little Prep Sol will help to remove any left over Friskit gum without damaging the paint or Ultracoat. I use Prep Sol to clean any dirt or oils from the Ultracoat before adding trim. Cut the checkers with a new # 11 X-Acto blade and pick out every other check to form the pattern. The checkers were cut with a see temp template to give the curved effect. They are not ironed onto the wing in this picture, just positioned to see how they will look. The leading edge of the wing is Monokote metallic blue paint and the gold stripe is Goldberg Ultracoat. This Four Star 40 was a test bed for experimentation with different products that I have no experience at using such as the Monokote paint. Danny and his Four Star 40 with the checkers applied to the wings. I decided to add a star to the point where the checkers converge for a different look.